Greywalls Hotel and Chez Roux Restaurant is a sublimely comfortable country house hotel offering a secluded setting within easy reach of Edinburgh; exquisite architecture and gardens; superb service; and outstanding food. You can read our dining review for Greywalls Hotel here. Greywalls is located on the eastern edge of Gullane in East Lothian and is a close neighbour of Muirfield, widely regarded as one of the world's very best golf courses. So close a neighbour, in fact, that one face of the house looks down the Muirfield's 10th fairway to the River Forth and to Fife beyond. A second main face of the house looks out in the opposite direction, over the six acres of beautifully kept formal gardens originally designed by Gertrude Jekyll. But it is a third aspect of Greywalls that greets you first, the almost iconic curved frontage that faces out onto the drive. This view of the house is enough in itself to tell you that Greywalls is somewhere rather special: which is exactly what it was always intended to be. Greywalls was designed by Sir Edwin Lutyens and built in 1901 as a holiday home for the Hon Alfred Lyttelton, a keen golfer. The house was sold to Mr William James in 1905, but proved too small for his needs. He therefore engaged the architect Sir Robert Lorimer to build gatehouse lodges in 1908, and a major new wing on the west side of the existing house in 1911. House parties held here in the years immediately prior to World War I included amongst their guests King Edward VII. The house was purchased by Lt Col Sir James Horlick in 1924: and his descendents, the Weaver family, still own it. 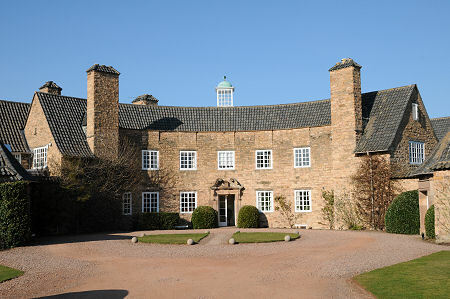 Greywalls opened its doors as one of Scotland's earliest country house hotels in 1948. In more recent times it has served as an exclusive use venue, but reopened as a hotel under the management of Inverlochy Castle Management International in May 2010. Since then a rolling programme of refurbishment has been under way to modernise the accommodation while completely respecting the heritage of Greywalls. You enter Greywalls via the door in the centre of the curved frontage and feel immediately that you are walking into a someone's home. This sense of being a house guest rather than a customer is reinforced as you tour the house, which comes complete with family memorabilia. Guests can choose between a number of comfortable areas in which to sit and relax. The main hall broadens out into a lounge area complete with an open fire on cold nights, and leads through to the exquisite library. Here the thousands of books complement an array of comfortable seating and an open fire to create a space you only leave with regret. Beyond the library is the drawing room which in turn leads to the sun room, while elsewhere on the ground floor of the hotel is the main dining room and neighbouring original dining room, both looking out over Muirfield. There is also a cosy bar; and the whisky room, a room ideal for private dining or small meetings. Guests may also stroll around the gardens, or simply sit and watch the golf from one of the seats on the Greywalls side of the ha-ha that divides its property from the golf course. There are 23 well equipped and very comfortable en suite guest rooms at Greywalls. Seventeen are in the main house, while another five are in the gate lodges which flank the entrance to the front courtyard, and one occupies a corner of the garden. One room has a walk in shower, but the physical constraints of the house means that Greywalls does not regard itself as having good access for disabled guests. A further ten guests can be accommodated, on a self catering or hotel basis, in the nearby Colonel's House. Rooms in the main house tend to look out either over the garden, or over Muirfield. Golf is important at Greywalls. On two days a week it is possible for hotel guests with a sufficiently low handicap to arrange a round at Muirfield, and looking just a little more widely there are 10 golf courses within five miles of the house. The sheer beauty of Greywalls makes it an attractive place to hold a wedding, and up to about 50 guests can be accommodated on an exclusive use basis in the dining room and in the hotel's guest rooms. Meanwhile a wedding of up to 300 guests can be held using a marqee in the grounds; and much smaller and more intimate events can also be accommodated. Greywalls' charisma, the flexibility of the accommodation on offer, and a location within an easy drive of Edinburgh, also combine to make it an attractive venue for a wide range of corporate functions and events. There are some hotels that are so good you just do not want to leave, and Greywalls is one of them. We visited with very high expectations, and for reasons set out above and in our accompanying dining review found those expectations to be surpassed. You can read our dining review for Greywalls Hotel here.